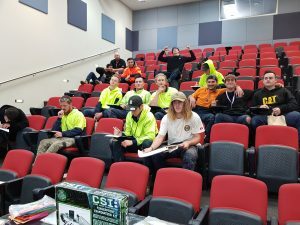 5.10.2018 the ACV/GARDS girls gave another asbestos awareness session to another class of apprentice plumbers at Chisholm TAFE Berwick campus. Good questions asked and more apprentices asbestos aware. We are very pleased to have been able to get to so many apprentices this year. We still have one more class at Frankston next week. We hope that those apprentices we have spoken with this year will take some of what we have tried to alert them to back into their working life and home environment.